The old Washington axiom — the president proposes and Congress disposes — is never truer than on budget day, and in keeping with tradition, Republican lawmakers are quickly dismissing the Obama White House's first fiscal blueprint. "It would be better if we did nothing than actually pass this budget," said Wisconsin Rep. Paul Ryan, the chairman of the House Budget Committee, saying the proposal was "debt on arrival," pun intended. "It runs the risk of a cataclysmic event," was the response of Jeff Sessions of Alabama, ranking Republican of the Senate Budget Committee. "It will fuel more economic uncertainty and make it harder to create new jobs," offered House Speaker John Boehner in a statement. Even Democrats struggled to enthusiastically endorse the $3.73-trillion spending plan. Sen. Kent Conrad (D-N.D.), chairman of the Senate Budget Committee and a member of the bipartisan National Commission on Fiscal Responsibility and Reforms, said, "We need a much more robust package of deficit and debt reduction over the medium and long term." The substance of the critiques focus on the long-term debt outlook, which Republicans say remains perilous even as the White House touts the fact that yearly deficits will be more than halved under the proposals. Speaking with reporters Monday, one senior House Republican budget aide said the United States would be rejected for membership in the European Union because of its staggering debt in relation to gross domestic product. But the White House sees its budget proposal as simply the starting point in lengthy negotiations with the GOP. "It's a comprehensive budget, which puts all areas of the budget on the table," Jack Lew, Obama's budget director, told reporters. "It accomplishes the goal of stabilizing our deficit. We now look forward to working with the Congress on all the areas that it covered." 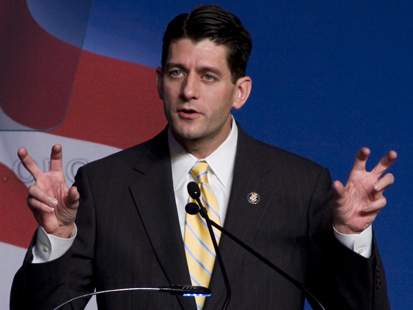 Rep. Ryan said Republicans will not make a counter offer for at least another two months. First, the administration plan must be evaluated by the nonpartisan Congressional Budget Office, and then Republicans must work within their caucus to reach consensus on their response. Elise Foley pointed out for The Huffington Post that Sen. Jeff Sessions told reporters on Capitol Hill that the bill would reduce the deficit by only a "negligible" $300 billion - in comparison House Republicans are currently trying to cut around $60 billion from spending. First, I think it is interesting that Republicans stated they would not have a counter offer for at least another two months, despite them claiming for close to a year that if and when they gained control of the House they would focus on the budget - since being sworn in, Republicans have focused their energy on symbolic legislation and divisive partisan issues to satisfy their base. Secondly, Ryan had indicated that the Republicans will wait for the administration's plan to be evaluated by the nonpartisan Congressional Budget Office (CBO) before the GOPreach a concsensus on their response, but Ryan has a history of ignoring CBO projections when things don't go his way - for instance, Ryan complained about the CBO's estimates regarding the health care reform bill and their estimates dealing with a possible repeal. Ezra Klein does an excellent job pointing out the numerous misconceptions and lies about the CBO estimates. Basically, Republicans are upset with the budget proposals, which cut into programs widely considered by conservatives to be Democratic expenditures, because Democrats are the ones who came up with them. Even if you were to put in cuts to Title X programs, like funding for organizations like Planned Parenthood, Republicans would still be opposed because they did not originate the proposal. I'm not stating that I support or oppose the president's proposal - I think it is extremely bipartisan for the president to propose cuts to social programs - but I definitely believe Republicans to be hypocrites about the entire thing.